Clean spots and stains immediately. You will have much better chance of removing them if you do not allow them to dry. So firstly, if the spot is wet, blot it, don’t rub. Scrape off any solids. Blot up liquids quickly, dabbing lightly with a clean white towel or paper towel. After this you can press harder with you knee on the paper to really get all the moisture up. Keep doing this with new towels or paper until you can’t get any more transfer from the fabric. If the stain is still present you can use a small amount of water mixed with white vinegar (1 part vinegar to 3 parts water) to re-dampen the stain using your paper or towel, don’t just pour the water on. Now repeat the process of removing moisture. To avoid causing water or ring marks, make sure that the treated area dries out evenly by feathering out the edges, or dampening the entire panel. It’s tempting isn’t it. Resist the urge! On wool especially you’ll cause pile burst leading to a fuzz being left or even worse you’ll be spreading the stain. Even if you get the stain out you may be left with something that looks a lot worse, caused by rubbing. I know what your thinking, “I’ve got some supermarket cleaner in my cupboard that should clean that…” . The amount of carpet & sofas we’ve seen ruined by these products runs into the thousands, some contain bleaches, others various nasty’s which just add to the problem. If you are going to use one, pre-test it on a hidden area and let it dry, only then will you know if it’s going to leave a light bright patch or worse on your carpet or sofa. Always rinse the cleaned area thoroughly, if not removed, these cleaning products may cause the cleaned area to attract dirt. To remove greasy stains, try a dry-cleaning agent on a white towel. Always pretest any cleaning agent on an inconspicuous part of the carpet and let it dry before continuing. 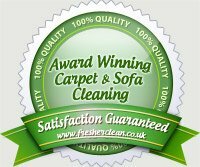 Hopefully your stain is now gone, if not try calling a professional carpet or sofa cleaner in your area…or us! You’ll be surprised at what we can remove saving you an insurance claim.